No fewer than 9 people died in an early morning road crash in Awo community in Irepodun/Ifelodun LGA of Ekiti State. The bus conveying ten passengers was said to have rammed into a truck travelling in the same direction. A resident of Awo community told Bounce News , that the 18-seater bus collided with the planks laden-truck said to be moving ahead and lost control in the process. The affected passengers were said to have died on the spot as they were mangled in the crushed bus, while one person survived the fatal accident. 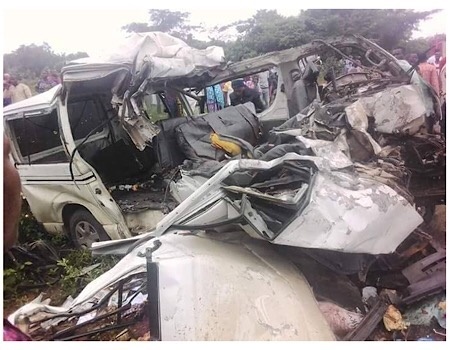 The only survivor of the crash which occurred in front of the Independent National Electoral Commission (INEC) at Igede – Awo road was said to have been rushed to hospital. The bus, with registration number EKY 978 XJ, according to the source was believed to be travelling from Lagos, while the destination of the trailer attached to a DAF truck with registration number XB 404 FKA was not immediately known. 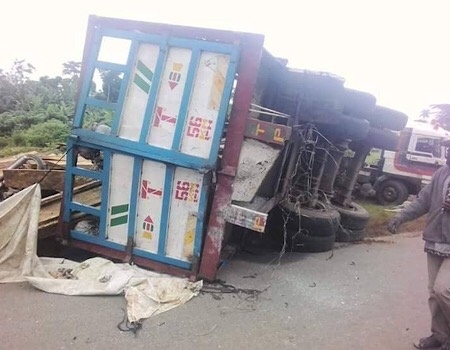 Confirming the incident, the Public Education Officer of the Federal Road Safety Corps (FRSC), Mohammed Olowo, said the possible cause of the accident was disregard for speed limits. Olowo revealed that the accident occurred at about 6:15am, 18 people were involved. He added that the bodies of the dead had been deposited at the mortuary of Federal Teaching Hospital, Ido-Ekiti was also receiving treatment at the same hospital.